HRL Laboratories, LLC, has developed a high-resolution, low-power radar antenna array (coded aperture subreflector array, CASA) that potentially can see weapons or explosives concealed on a person at tactically safe distances. With a CASA scanner, someone concealing a suicide bomb could be detected while they were still far enough away to make a sudden detonation far less effective. The low power usage and scalability of the CASA array gives it versatility for many possible uses, from the aforementioned security scanners to being part of the eyes and ears of robots or autonomous vehicles. One constraint in this type of coded aperture radar technology is that it tends to be more useful for shorter ranges, but that makes it ideal for such uses as security screening at safe distances. Radar can also see through smoke and dust, so CASA could be useful for seeing approaching people or vehicles in low visibility situations. It could also help helicopters navigate through dust, other atmospheric obscurants, or darkness by imaging landing areas with high resolution. Current airport scanners require subjects to walk through the apparatus to be scanned. The CASA was developed by HRL researchers under the Defense Advanced Research Project Agency (DARPA)’s program Advanced Scanning Technology for Imaging Radars (ASTIR). CASA array. © 2017 HRL Laboratories. The CASA radar array scans high-resolution 3D images with a digitally synthesized beam, which means the array itself does not need to be moving, but creates the images by digitally processing the data collected by the beam’s reflection off targets. 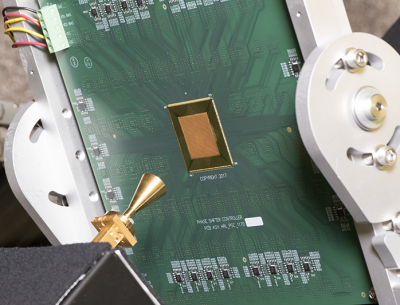 The team, from HRL’s Microelectronics Laboratory, used a tiling approach to make the radar antenna array, with 1-inch-square radio frequency (RF) tiles. “The tiles make the array scalable to whatever size is needed for a particular task. You can add more tiles over a fairly large area and get thousands of pixels in your images. Also, we fabricated the tile arrays with wafer-scale integration that really keeps costs in line,” Lynch said. The CASA array operates at a very high frequency because the higher the frequency, the narrower the radar beam, and the greater the image resolution. “With such high frequency, we fabricated a 1,024-element radar antenna array that is about an inch on a side. The little antenna elements are only 700 microns (one micron = one thousandth of a millimeter) apart, based on spacing them half a wavelength apart. That’s how small the wavelength of the beam is,” Lynch said.